Creative Pavers, Inc. Maple Shade is a full service landscape and hardscape construction firm serving Maple Shade, New Jersey 08052. We are proud to announce that we have completed the first phase of our Indoor & Outdoor Design Center. 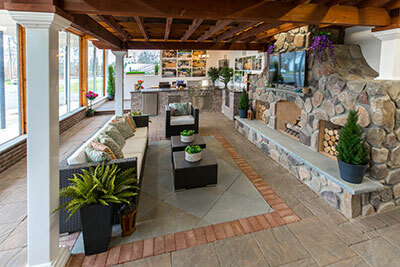 Beginning with a 1,200 square foot indoor showroom that showcases a Custom Stone Veneer Fireplace, Outdoor Kitchen, Multi-Level Paver and Deck Flooring with Custom Cut-Outs, Garden Walls, Combination Wood & Composite Pergola, and a Landing & Steps leading to a Stone Veneer framed door, this space is where our customers can come and see and touch the different products in a setting that allows them to visualize the potential for their space. A portion of this room is designated to be able to sit down and relax as we can scroll through the 1,500+ projects that we have competed on a 60” TV screen to get even more ideas flowing. If drawings for your project have already been completed by one of our designers, we can bring up your personal project plan on the same large screen and collaborate with each other as we make the computerized adjustments needed to the space right in front of your eyes. After you get a feel for all of the options, you can walk over to the 11’ tall floor to ceiling windows and look out into our outdoor portion of our showroom and see over 60 different products on display that are installed throughout the front of our building. We welcome everyone to visit and we are open to the public. Please Click Here for directions. If you need a dedicated designer to spend time with you an appointment is preferred, but feel free to stop in and check it out! Our job here at Creative Pavers is to provide you with the ideas, know-how, and excellent service that enable you to let your mind dream and make your own personal wish come true. You would have trouble finding anyone as easy to work with as us and while talking to any of our representatives you can easily see that. We like to be challenged and enjoy what we do which shows in our work. Ask any of our numerous references. We promise to treat every job as if was our own home that we were working on. So we wish you luck in your venture to create your own personal landscape and we promise to help you every step of the way.